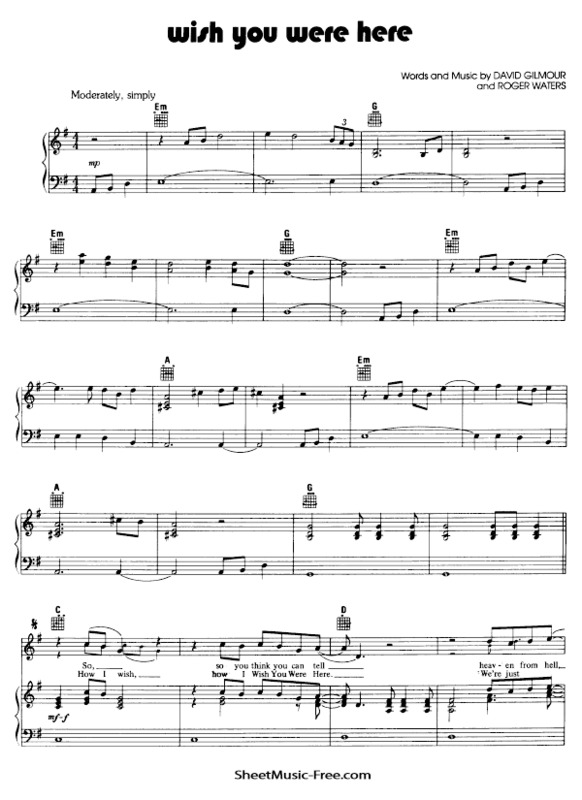 “Wish You Were Here Sheet Music” by Pink Floyd, “ Wish You Were Here Sheet Music” for Piano / Vocal/ Guitar Chords , Original key: G Major, number of pages sheet music PDF: 5, Video and Lyrics song Wish You Were Here Sheet Music. “Wish You Were Here’” is the title track on Pink Floyd’s 1975 album Wish You Were Here. Its lyrics encompass Roger Waters’ feelings of alienation from other people and his distrust for the music industry. Like most of the album, it refers to former Pink Floyd member Syd Barrett and his breakdown. David Gilmour and Waters collaborated to write the music, and Gilmour sang the lead vocal. On June 14, 2013, the song was released as an unofficial promotional single on Spotify and when fans streamed it one million times, which happened after only four days, the rest of the band’s catalogue was released. Wish You Were Here Sheet Music Pink Floyd.